One of, if not the hardest thing about losing a spouse is you lose the person who is usually your support during difficult times. Now, in the darkest time of your life- you find yourself, alone. Sitting beside each other as passengers does not mean you will see everything in the same light or have the same ideas, friends, hobbies, or even passions, and in fact, this is what enriches your joint experience of the world more than anything…this togetherness and otherness tied into one. And then, there I am sitting watching the story of your departure from behind “our” now shattered window. There I am without your hand on my shoulder, or your own shock or witness, to this- the most horrifyingly bizarre thing either of us have never imagined. I am perversely jealous of the victims of other tragedies who write in their memoirs about the support offered to them by their spouse through it all. 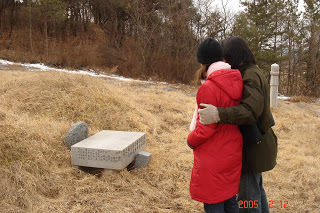 Because there I am, not as I am below- with your arm around me at your grandparents’ grave on a hillside in a small Korean village the first year of our marriage. No, there I am, so suddenly- alone- at your own grave. I came across this photo a few months ago. I just keep looking at it. Like so many other times that I have read your blog I found myself sitting here saying yes, yes! You are so amazing at describing what it's like to be widowed. I read of other losses and can't help sniping – yes, but you had your partner, didn't you. Yeah, terrible thing. But you had your partner, didn't you.